By 1898, Gustav Klimt (1862–1918) was president of the Vienna Secession, and hard at work on ambitious paintings for the Great Hall of the university. The Secession’s first exhibition, held between March and June, was an enormous success, with over 56,000 visitors and very healthy sales too. Its second exhibition opened on 12 November, and was the first to be held in the organisation’s new building in Vienna. Klimt was already starting to encounter opposition to his art, though. He had had to change the poster used to advertise that first exhibition, and the commission which was overseeing his work for the Great Hall of the university deemed that one of the female figures in the Medicine faculty painting was obscene. Gustav Klimt (1862–1918), Portrait of Sonja Knips (1898), oil on canvas, 141 × 141 cm, Österreichische Galerie Belvedere, Vienna, Austria. Wikimedia Commons. Klimt’s portrait-painting was starting to become popular, particularly among the younger women of Vienna’s upper class. 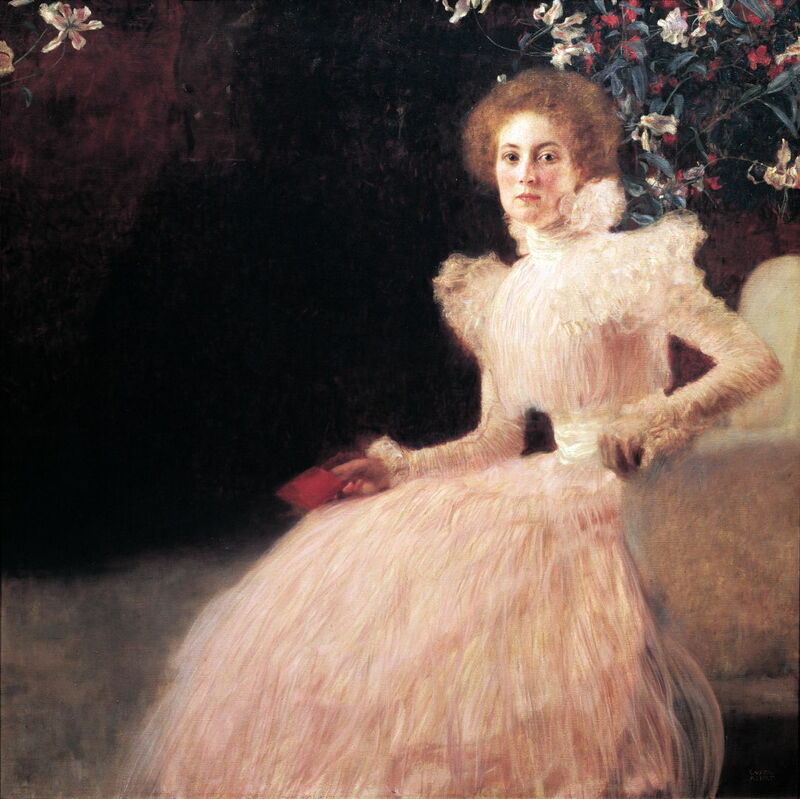 Portrait of Sonja Knips (1898) is often compared to Whistler’s female portraits, although for Klimt it was more of an intermediate step in his progress to later radical styles. It was acclaimed when exhibited at the 1900 World Exposition in Paris. Knips was a lasting friend and patron, both to Klimt and the Secession more generally. As the Baroness Poitiers des Eschelles (1873-1959), she was the wife of the industrialist Anton Knips (1876-1946), an iron and steel magnate. 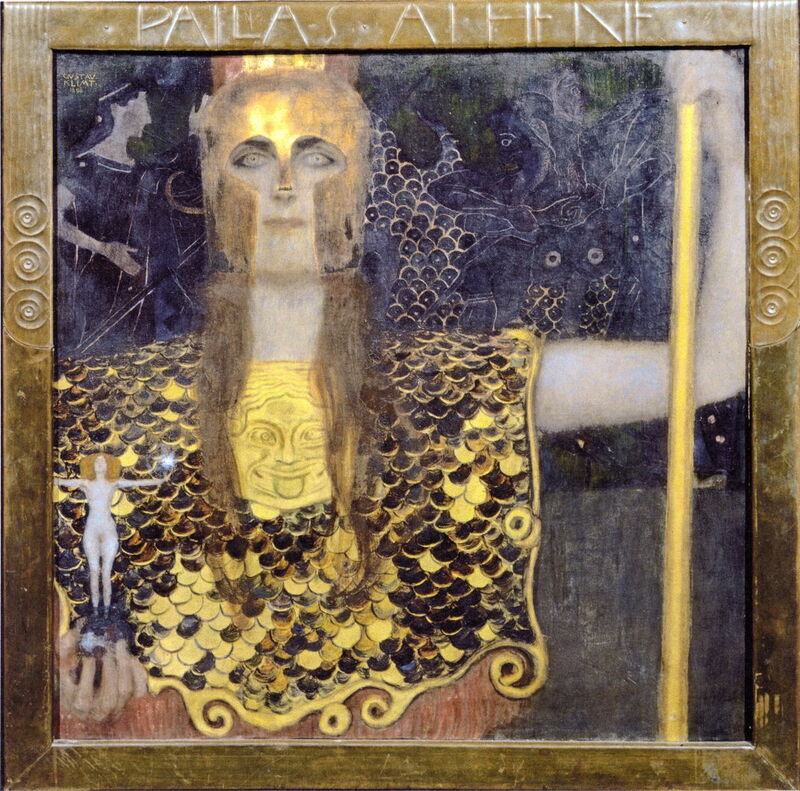 Pallas Athena (1898) is an early foray into the incorporation of gold into Klimt’s painting. This shows the goddess, complete with her traditional attributes of the aegis of Medusa’s head over her upper chest, a spear and helmet. Although Medusa’s head might appear comical, Klimt modelled this after classical Greek depictions, and the background of the upper half alludes to the paintings on classical pots. The pattern of her chain mail armour overflows her left shoulder into that background. This too was exhibited successfully at the 1900 World Exposition in Paris. 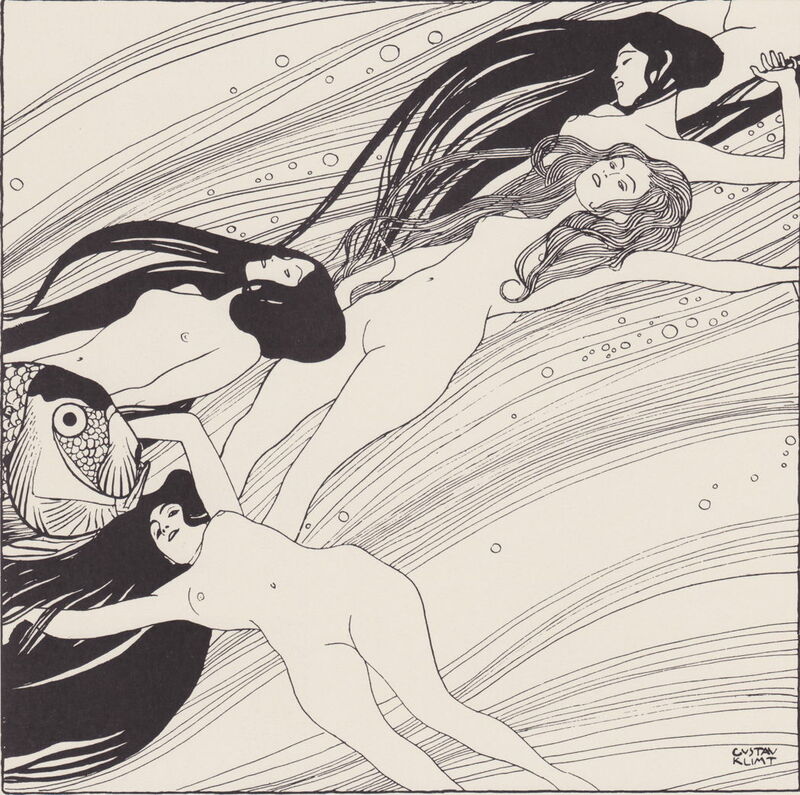 Gustav Klimt (1862–1918), Fish Blood (1898), print in ‘Ver Sacrum’ issue 3, March 1898, p 6, 18.5 x 18.5 cm, Österreichische Galerie Belvedere, Vienna, Austria. Wikimedia Commons. 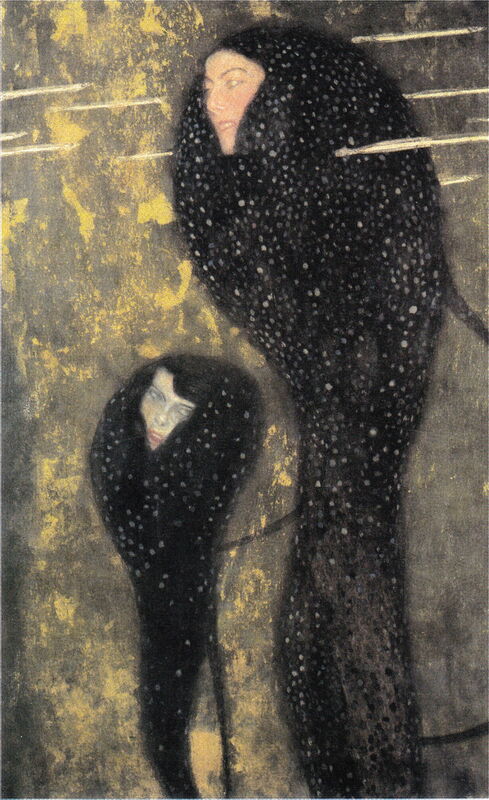 The first issue of the Secession’s monthly magazine Ver Sacrum was published in January 1898, and Klimt’s Fish Blood (1898) appeared in its third issue. This is overtly Art Nouveau, and a reminder of his masterly draughtsmanship, as well as his sustained fascination with the form of the female body. Gustav Klimt (1862–1918), Mermaids (Silverfish) (c 1899), oil on canvas, 82 x 52 cm, Private collection. Wikimedia Commons. Mermaids (Silverfish) (c 1899) remains in the water, with its unique tadpole-like creatures and their smiling, womanly faces. Although he didn’t seem to be selling much work, and had five female dependents including his mother, sister, and in-laws, Klimt spent much of 1899 away. In the Spring he toured Italy, then for most of August was on holiday in Golling, near Salzburg. Over that same period, Mizzi Zimmerman, one of his favourite models, gave birth to their first child. Gustav Klimt (1862–1918), After the Rain (Garden with Chickens in St. Agatha) (1898-99), oil on canvas, 80.3 × 40 cm, Lentos Kunstmuseum Linz, Linz, Austria. Wikimedia Commons. Klimt had probably painted his first small landscapes between 1881-87, and returned to the genre more seriously in about 1896. This work, variously known as After the Rain, Garden with Chickens in St. Agatha, or similar, is thought to have been painted when Klimt stayed in the Goiserer Valley with the Flöge family in the summer of 1898. It is one of his few works which shows transient conditions, and shares a softness with his portrait of Sonja Knips. Bad Goisern is a small spa town in the the picturesque countryside of the Goiserer Valley, near Hallstatt in central Austria, which had become a popular resort for the Viennese to spend their summer holidays. 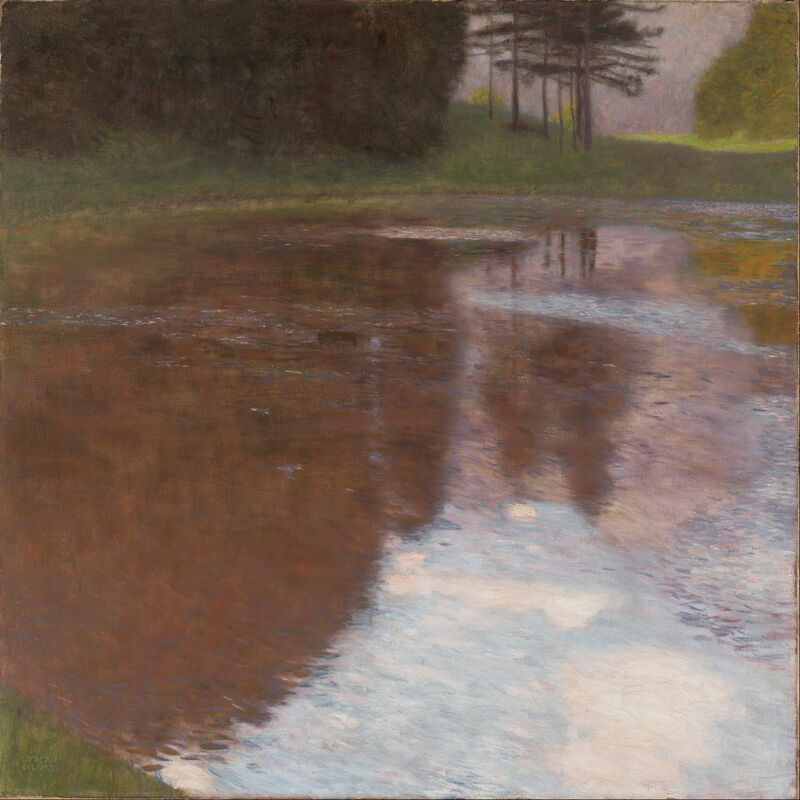 In 1899, the Flöge family and Klimt holidayed in the popular resort of Golling, where he is thought to have painted three landscapes, including Tranquil Pond, also known as A Morning by the Pond, or Egelsee near Golling, Salzburg (1899). This has been compared with Monet’s paintings of the Seine in its emphasis on and treatment of reflections on the water surface. Egelsee is a small lake near the small market town of Golling, which rests in the valley beside the Berchtesgaden Alps, to the south of Salzburg, Austria. It is fascinating that whilst Klimt was there, he was surrounded by spectacular mountain scenery, castles, waterfalls, and gorges, none of which he appears to have drawn or painted. Gustav Klimt (1862–1918), Cows in a Stall (1899-01), oil on canvas, 75 × 75 cm, Lentos Kunstmuseum Linz, Linz, Austria. Wikimedia Commons. 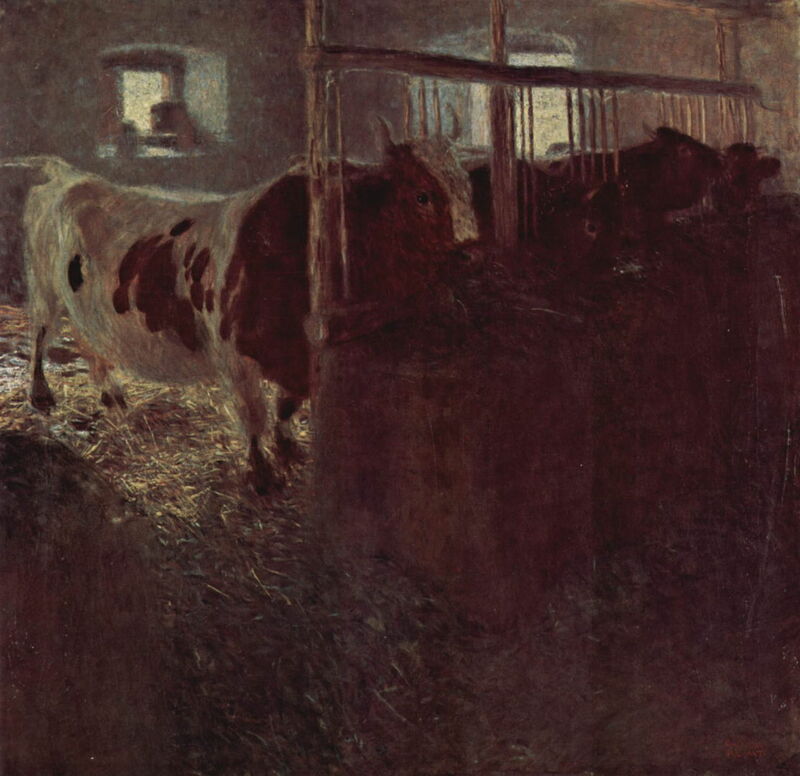 Cows in a Stall (1899-01) is also believed to have been painted during the holiday at Golling, and may appear one of Klimt’s least characteristic works. In August 1900, Klimt spent another holiday with the Flöge family, this time on Attersee, a resort which he was to return to every summer until 1916. In this first visit, he developed his treatment of rippled water in at least two paintings of the lake itself. 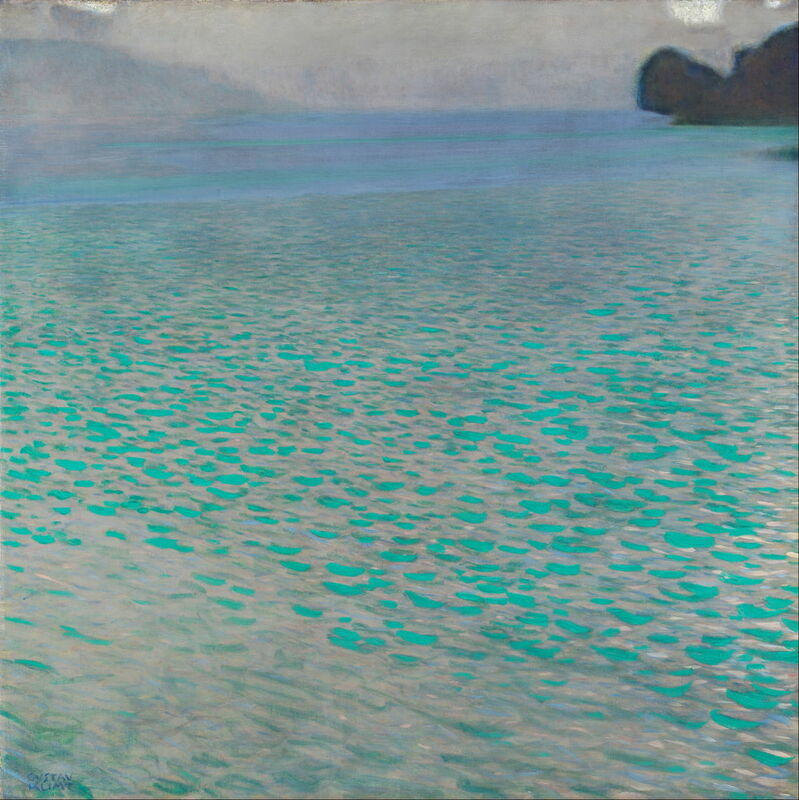 Attersee I (1900), with its unusual colour harmonies and painstakingly measured brushstrokes, is the better-known of the two. Attersee (or Kammersee) is a large lake in the Salzkammergut Mountains, which was and remains a favourite area for summer holidays among the Viennese. As at Golling, Klimt was surrounded by spectacular scenery, including Litzlberg Castle, but in this first visit at least was very restrained in his choice of motifs. Gustav Klimt (1862–1918), Farmhouse with Birch Trees (1900), oil on canvas, 80 × 80 cm, Österreichische Galerie Belvedere, Vienna, Austria. Wikimedia Commons. 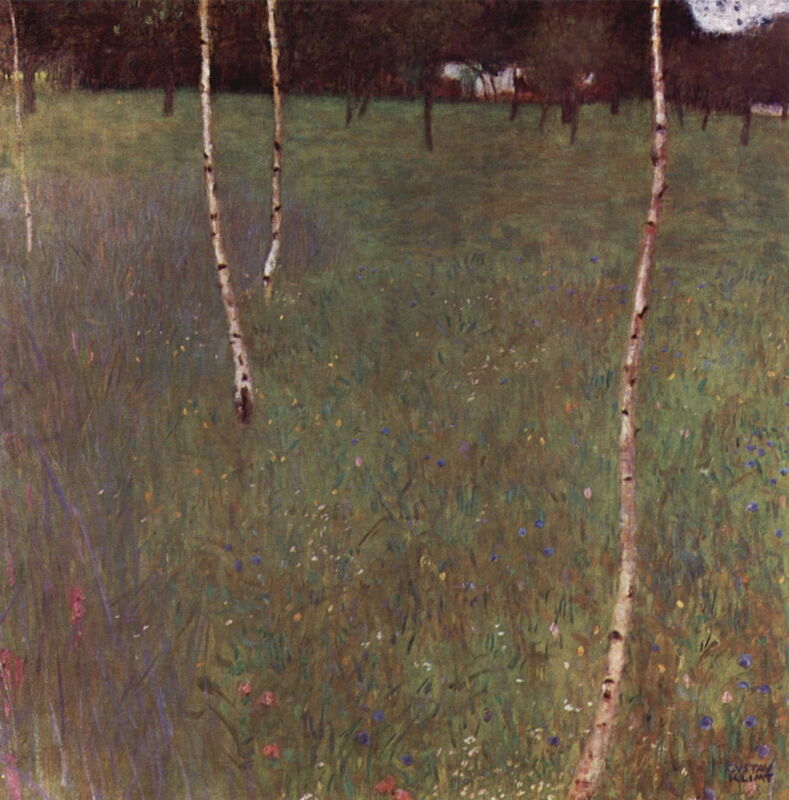 Farmhouse with Birch Trees (1900) is another of the half-dozen paintings which Klimt completed during that holiday. At this stage, his vegetation is textured but not yet Divisionist, and the contrasting young birch trees are slightly soft-focus. In March 1900, at the sixth exhibition of the Secession, Klimt’s first finished painting destined for the Great Hall of the university went on display. It proved extremely controversial, with 87 of the university’s professors protesting against it. Klimt’s career was not going to be dull. Posted in General, Life, Painting and tagged art nouveau, Klimt, landscape, Monet, painting, Secession, Whistler. Bookmark the permalink. wonderful compact survey of an artist whose works are so richly varied! Thank you. I hope that you continue to enjoy the series as it gets to his more famous figurative and landscape works.